The following remarks are intended to supplement the author's paper "Blueprint for a Bulosan Project" posted in the online journal OUR OWN VOICE. This essay critiques the position of "leftists" in the elite U.S. academies who claim a "manifest destiny" to civilize colonized subalterns and peasant radicals like the Filipino writer Carlos Bulosan who (they claim) have failed to take "America" out of a transnationalizing U.S. Studies. Are we seeing a replay of the "Thomasites" who produced generations of neocolonized "little brown brothers" now serving U.S. imperialist aggression in Iraq, Aghanistan, Palestine, Mexico, Colombia, Venezuela, and in the Philippines, its former direct colony? "By the rivers of Babylon, there we sat down, yea...."
Thanks to the Library of Congress and other sponsors of today’s historic event, Carlos Bulosan—let’s call him Allos, as though we were his kasamas in Binalonan, Pangasinan, or in Manilatown in Los Angeles—is returning for the second time to Washington, DC. His spirit, or ghost, I mean, though it is presumptuous, maybe even sacrilegious, to invoke it, much less assume we can impose our wish or will on it. Individuals really exercise only very meager control on how decisive circumstances unfold, even though we (especially academics) pretend to have some say or “agency.” Ditto for philanthropic “do-gooders” professing “Marxist” credentials (more later). …I began to ask myself why he [Quezon] felt so close and confidential to me. I began to contemplate what I was a year ago, a common laborer, a migratory farm worker, who had lived in the slums of both America and the Philippines—was it because this man, the avowed leader of his people, was also of humble origin and went through heart-rending deprivations in his youth? It was then that I felt kinship with him, a feeling so great that it sustained me in my perilous trip back to Los Angeles and immediately afterwards, became the dynamic force that moved me to interpret him to the misinformed Filipinos in California (1944, 14). Allos had no real solid knowledge of Quezon’s “humble origin” or the “heart-rending deprivations” of Quezon’s youth. But when he read the attacks on Quezon in fascist-inspired Filipino newspapers in California, Allos came to the defense of the exiled Commonwealth government. It was still “united front” politics then. Allos proceeded from DC to New York (where he met Jose Garcia Villa) to sign his contract with Harcourt Brace before returning to California. President Quezon telegrammed him afterward for a “memorandum on the Filipinos in the West Coast.” Allos failed to fulfill his promise; instead, he “hoped that my autobiography…would give him all the materials he would need…that in presenting the life story of a common Filipino immigrant, who had just attained an intellectual integrity that could not be bought, I would be presenting the whole story of the Filipinos in the United States” (15). Note how a radical reversal occurs here. It is Quezon now who will compose, endorse or ratify Allos’ biography, not Allos acceding to the ilustrado’s request. Allos, the uprooted peasant, re-invents himself as the emblem or ethnic index to the whole uprooted community, not the coopted ilustrado. Some kind of retributive transposition occurs—symptom of peasant ressentiment? At the end of this tell-tale article, Allos bade farewell to Quezon who, conducting the “good fight…died at a time when it seems sure that our country will be free again, and will assume her independence in a world federation of free and equal nations” (15). That future of “free and equal nations,”contrary to Allos’ sentiment, remains in the future. Allos, to be sure, not only felt almost filial kinship with Quezon and his family, but also also a tributary, even quasi-feudal loyalty to Quezon as a symbol of the nation’s struggle for independence. This is a traditional peasant view of the elite. At this point, we need to interpose some historical perspective and assay the relative importance of Quezon as a representative of the entrenched propertied interests in the context of the recurrent grievances and revolts of Filipino peasants, workers and indigenous communities, throughout the Commonwealth period and the two and half decades before 1935. One can cite here the repression of the Tayug and Sakdal uprisings, among others, as well as Muslim dissidence, in which the oligarchy and later Quezon himself acted as partisans of the status quo. During the Cold War period and the McCarthyist witch-hunt, the State was for Allos and his brothers/sisters in the union a merciless persecutory force to resist. The extant account of Allos’ travels in the U.S. are sketchy, so it is difficult to determine what other links he had to the personnel of the exiled Commonwealth government, for example, to Romulo, J.C. Dionisio, Villa, Bienvenido Santos,and others. We do not have any information whether he met the members of the Philippine Writers League (either Salvador P. Lopez, Federico Mangahas, or Arturo Rotor—major writers in English in the thirties) who attended the Third Congress of the League of American Writers on June 2-4, 1939 (Folsom 1994, 241). 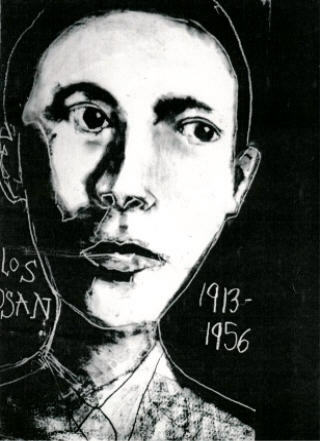 Allos was certainly acquainted with Lopez, the most significant critic of that period, evidenced by his letter in The New Republic “Letter to a Filipino Woman” (San Juan 1995, 210-14) whose death he prematurely announced (he mistook the guerilla writer Manuel Arguilla, murdered by the Japanese, for Lopez). …it is not really important to go to the university. A college degree does not mean that you are educated…Education comes after school, from your relations with your fellow man, from your understanding of yourself…Education is actually the application of this discovery: that you are a human being with a heart, and a mind, and a soul. Intelligence is another thing, of course… [Maxim Gorki] wrote books about the poor people in his country that showed that we poor people in all lands are the real rulers of the world because we work and make things. We make chairs, we plow the land, we create children; that is what Gorki means. But those who do not work at all, those rich bastards who kick the poor peasants around: they contribute nothing to life because they do not work. In other words, Fred, we can still have a nice country without money and politicians. We just need workers. Everything we see and use came from the hands of workers…. (1988, 36-37). My first comment is that the term “laborers,” though often derogatory or pejorative in intent, becomes so because we live in a system distinguished by class hierarchy. Due to the division of labor in class society, from slave to capitalist, manual work has been degraded by being associated with the unpropertied, unlettered groups; and thus people deprived of land, tools or animals, are confined to sell their labor-power and do manual“labor” while those free from laboring with their hands, supposedly educated, occupy a higher position or status. This is not a result of being uneducated, but of being dispossessed, racialized and colonized. Obviously, we all oppose class differentiation and discrimination, and I hope we are all united in rejecting such an insulting class-ridden system. I would use the term “peasant” as a descriptive category defining a group in relation to the means of production, in this case, land. It does not refer to status or life-style as such. It does not imply lack of education or low status—except from the viewpoint of the privileged idle landlord and business elite. Historically, in Europe, the peasantry was a complex group classified simply into the rich peasants who owned land they cultivated, did not employ landless persons as serfs (such as the feudal landlords) and had some power and prestige; the middle peasants who may own land or not but who have independent means, and the poor or landless peasants reduced to debt peonage and serfhood. You can refine this category further by including ideology, ancestry, customs, etc. In the Philippines, however, the Spanish colonial system narrowed the classification into two main ones: the Spanish landlords who owned fiefdoms and operated through caciques and hired overseers, and the majority of dispossessed natives. Even Rizal’s family had to lease their farms from the Dominican friars. Objectively, Rizal came from the rich peasantry; but their access to education and lineage aligned them with the ilustrado fraction who, while not owning land, accumulated some wealth through farming, trade, etc., that enabled their separation from the landless poor colonized subjects. Because Filipino peasants became proletarianized when they moved to the towns and cities while maintaining the peasant ethos of the traditional village, their sensibilities and behavior reflected the vacillations typical of the youthful Allos and his social class. Thus we observe Allos’ strong spirit of solidarity and egalitarianism mixed with his desire to move beyond the traditional regime of submission to authority, to the power of the inheritors of prestige and privilege founded on property. So when historians trace the genealogy of the “Manongs” to the peasantry, it is not meant to debase them as “uneducated” or “only” laborers. Studies of the peasantry (in itself, a rigorous scientific discipline) by Eric Hobsbawm, Eric Wolf, James Scott, Theodor Shanin and others have demonstrated the sagacity, intelligence, shrewdness, and wisdom of the peasantry. Their adaptive skills have not been surpassed by the modern urban entrepreneur. Needless to say, formal education is not a measure of intelligence or wisdom. The best illustration of this is Allos’ The Laughter of My Father, as well as other stories collected in The Philippines Is in the Heart. As for the degradation of workers and laborers, this is part of the history of the rise of capitalism. The Depression was a crisis of this system, worsening the plight not only of unemployed and starving millions of citizens but, more severely, of people of color like the “Manongs.” They were not, strictly speaking, immigrants (not until the Commonwealth would there be an immigrant quota for Filipinos) but colonial subjects barred from access to citizenship. In addition, they were also a proletarianized and racialized minority. Productive labor, of course, is the source of social wealth, though from the viewpoint of a market-centered economics, labor is downgraded from the view point of capital and ownership of land and productive means. This is the effect of judging everything in terms of exchange value, not use-value, the result of translating all values into money, possessions, or commodity-fetishes. This is the moment to confront the problem of white-supremacist “Americanism” posing as minority-model “Marxism.” Practically all readers of AIH, with some exceptions, read it only as an immigrant story, or at best, a “Popular Front” collective biography, as Michael Denning and others have done. Obviously it is far from being an exemplary narrative of immigrant success. There is arguably more allegory, gothic melodrama, and utopian fabulation in AIH than in Laughter. As I have stressed in my paper, the inability to understand the substantive function of the first part of AIH, from chapter 1 to 12, is a symptom of the larger failure to understand the political and cultural actuality, significance, and consequence of the colonial subjugation of the Philippines from the time of the Filipino-American War of 1899 up to 1946, and its neocolonial dependency thereafter. It is a crippling failure which leads to all kinds of vacuous, ill-informed pronouncements (which I will illustrate in a moment). This is the reason why I propose that we decenter the Bulosan canon and begin with The Cry and the Dedication, Laughter, his essays, poetry, and his other writings in approaching the totality of his achievement (see my paper “Blueprint for a Bulosan Project” in the online journal, In Our Own Voice). The other works avoid the celebration of “America” as the totemic paradigm of freedom and democracy. We hope to correct the formalist framework of intelligibility that would exclude the historical context of the profound colonial subjugation which Allos and the Filipino people as a whole experienced from 1899 up to the present. It would result, first, in espousing 200% Americanism; second, confusion in making sense of the contradictory messages of the narrative; and third, a cynical acceptance of immigrant success leading to a dismissal of the work as tedious, naïve, a multiculturalist factoid. (See Jessica Hagedorn’s visceral repudiation of Bulosan in The Gangster of Love.) I will not go into the reasons why AIH turned out to be such an ideological pastiche well before the vogue of postmodernism—I have supplied some reasons in my paper. ….I am not claiming that Bulosan’s desire to bring technological development to the Philippines—seeing its economy as needing…”development”—is what is wrong here. While the Philippines is poor and oppressed the attempt to bring some of what the U.S. has to it is obviously appropriate and deserves the support of all U.S. leftists, whether or not we are Filipino….Just as the wealth of the United States, earned in part through imperial presence in Asia, allowed Bulosan the space to become a writer, such a continuing disparity of wealth, where it occurs, and the colonial legacy, even where it doesn’t, may ensure the continuation of this pattern [of allowing the Philippines to develop into a full-blown industrial capitalist power] (1995, 49). Bulosan opens the book with a moment of disjunction, an explicit contrast between a young peasant boy, Carlos himself, working the land with his family and the intersection of this apparently primeval scene with the outside world, most specifically the world of a war in Europe, where Carlos’s brother Leon is fighting. No reason is given why a Filipino boy would be fighting on another continent; instead, the fact of the global situatedness of the peasant economy is the theoretical premise of the book, what which the intelligent reader must already know (1995, 46). What Mostern forgot was precisely his self-professed duty to apply materialist dialectics to this “global situatedness,” one which is mediated by U.S. colonial rule. He forgets what almost everyone knows: Filipinos, just like today, are enlisted to fight U.S. corporate wars; that the serflike or slavish existence of landless peasants like Allos’ father and millions like him have been legitimized by the preservation of the power of the oligarchical landlord class as a political strategy of neocolonial rule; and that the fight for independence against U.S. colonial oppression is what motivated the popular-front struggle here and in the Philippines against fascism (part of the oligarchy supported Franco in Spain) and Japanese militarism (part of that oligarchy believed it was a useful foil to U.S. imperialism). Reading AIH as a glorification of “Americanism” or American Exceptionalism may in part be due to the editorial cleansing of the text itself. It is, as some have duly suspected, a very sanitized text in its silence over the destructive effects of U.S. colonial rule, especially the years from 1914 to 1948. Given the Filipino rejection of Spanish autocratic rule and religious authoritarianism, American proclamation of its “civilizing mission,” complete with Thomasite teachers, public education, etc. was attractive. There was no other choice under the flag of “Manifest Destiny.” Except for the allusion to the January 1931 Tayug peasant insurrection, there is no mention in AIH of the Tangulan movement (1930-31) nor the Sakdal uprising of May 2-3,1935 and its aftermath. Nonetheless, it is absurd to erase or wholly obscure the scenes and chapters that expose the savage truth of “Americanism” in action, represented in white-supremacist violence on behalf of agribusiness and monopolies. Nor is it correct to assume that the presumed proletarian politics of the later part of the narrative has replaced “the peasant society” portrayed in the first section. In a revealing gesture, Mostern calls the Filipino workers “expatriates” whose “backwardness,” however, he deplores repeatedly in favor of an enlightened “leftist” United States Studies which turns out to be a vapid token of pettybourgeois wish-fulfillment. Mostern’s self-righteous act of patronage is typical of postmodernizing scholars guilty of the excesses of what Pierre Bourdieu (2000) calls “scholastic reason.” Presuming to be bearers of an omnipresent panoptic mind, they pass judgment on the world without any awareness of their own accessory location, their ineluctable inscription in the social-historical text of which they claim to be free. This stance of presumptuous objectivity may be simply dismissed as innocent, a self-indulgent reproduction of trivialities, or dangerous in being complicit with forces producing misery and horror for millions of human beings. Mostern wants to take out the “America” of the brainwashed subaltern in a sanitized “U.S. Studies—but is “United States” any less of a “rogue state” (Blum 2005) than the exceptionalist “America” of Anglo leftists in elite U.S. academies? Notwithstanding these caveats, thanks to Mostern’s nominalist syndrome, we are now alerted to the dangers of imposing formulaic solutions to neocolonial “backwardness” masquerading as latter-day “benevolent assimilation,” the Anglo’s “civilizing mission” in ultra-left disguise. “U.S. Studies without America,” any takers? One symptom of peasant subaltern ambivalence I mentioned earlier may be found in its affinity for millennial or messianic movements which reflect the reality of their isolated, fragmented lives. As Hosbawm notes, the unit of organized action for subaltern groups is “either the parish pump or the universe. There is no in between” (1984, 20). This may explain the inflated rhetoric of an “America” inhabited by an indiscriminate “common people” or “toiling poor, a utopian space beyond class and state, as well as its fragmentary segmented nature, a fact registered in the episodic, repetitious or segmentary flow of the narrative. These stylistic and formal qualities linked to the peasant world-view contrasts with the more cohesively class-conscious part of the narrative which reflects the basic social reality of proletarian existence—that is, of migrant contract workers who are colonized/racialized subjects—in being concentrated in groups of mutual if forced cooperation in farmwork and in organized union activities. But are Claro and Nick, the knowing smart guys, always to be trusted? Magno’s “love” turns out to be a collective trauma, a group fixation, to which systematic education (or mis-education, as Renato Constantino would put it) and ideological manipulation in the colony, among other forces, had made these lonely bachelors highly susceptible. The “romance” in the title, caused partly by anti-miscenegation laws but mainly by their colonized/racialized position, refers to this collective psychic illness whose origin and cure seems to inhere in the unsettled, unfixed but also regimented condition of contracted/recruited workers from the colony. Unlike the Chinese, Japanese and Koreans, Filipinos bear the singularity of being considered “savages” or “barbaric” for their fierce resistance to American “pacifying” troops circa 1899-1902 (as witness the “water cure,” retrenchment of entire villages, anti-sedition laws, and other ethnocidal measures) and their obssession with independence. Disillusionment for Magno begets a sense of pathos, but comic distance supervenes, and life returns to routine work in the end. On the whole, the characterization, setting, imagery, and style all exhibit Allos’ singular trademark, with an uncanny resemblance to the collective sharing of an illusion in “The Romance of Magno Rubio.” There is the same exchange of a value without the mediation of money or some reifying fetish. In Laughter, Allos reworked many traditional fables and anecdotes whose provenance in Arabic and Indian folklore is well-known and whose plots, motifs, and character-types continue to be reproduced by authors in many languages and cultures. It is the folk, the people, who function as the original authors; Allos’ task was to mediate between this world of subaltern folk and the world of industrialized capitalist modernity. We are not sure all of Allos’ characters in “The Romance” derive from the peasantry. All display in varying degrees the naivete, cunning, intelligence, resiliency and solidarity of peasants whose labor, while alienating, also preserves a certain humanity in them. Magno and his worker-friends were definitely not “guests of the State,” nor immigrants; they were, as many have noticed, colonial wards subject to all the disciplinary regime of anti-miscegenation laws, prohibitions and exclusions of all kinds. But the whole lesson of AIH is the transformation of the Filipino subaltern consciousness, fragmented but at the same time cosmic and global, into a critical and cohesively class conscious intelligence, through the process of affiliating with the organized political movement of a multiracial working class. This act of self-liberation through class liberation, however, is incomplete unless it is dialectically mediated through the emancipation of the colonized homeland, through national liberation. I think this is the ultimate lesson that cannot be gained without reading The Cry and the Dedication, the 1952 Yearbook, and the social contexts informing them. There is a fashion nowadays of claiming to be cosmopolitan or transnational as a safeguard against neoconservative fundamentalism, a latter-day version of multicultural Americanism, or pragmatic American Exceptionalism (see Ponce 2005; San Juan 2004). Transnationalism, however, apologizes for the hegemonic pluralism that legitimates imperial conquests and justifies the predatory market consumerism that passes for globalization. There is no escape from distinguishing between imperial nationalism and national-liberation struggles of oppressed peoples. What Hobsbawm once said remains true despite the vogue of neoliberal globalization: “The scale of modern class consciousness is wider than in the past, but it is essentially’national’ and not global…The decisive aspects of economic reality may be global, but the palpable, the experienced economic reality, the things which directly and obviously affect the lives and livelihoods of people, are those of Britain, the United States, France, etc.”( 1984, 22). Allos’ sensibility, with its peasant/populist ethos, mutated via a process of self-education and disillusionment into the more focused class-consciousness of the writer committed to the concrete program of union reforms and specific political principles of which the rejection of imperialism, segregation and racial apartheid, and support for the emancipation of colonies, are obligatory demands. One of Allos’ last public act of commitment to his vocation is the campaign to defend Chris Mensalvas and Ernesto Mangaong, militant leaders and officers of Local 37, ILWU, who were facing deportation, accused of being communists. The leaflet accompanying this campaign against Cold War McCarthyism condemns “the drive to deport foreign labor leaders” as “part of the hysteria that is terrifying the nation today. It is the vicious method of Big Business Race Haters to cripple organized labor and its gains, destroy civil rights and liberties, and abrogate the American Constitution.” Allos wrote a poem, “I Want the Wide American Earth” (echoing the earlier poem, “If You Want to Know What We Are”) to benefit the Defense Fund. In it he affirms that we, the multitude of productive men and women “have the truth/ On our side, we have the future with us” and “we are the creators of a flowering race.” (1979, 15). It is a Whitmanesque ode charged with universalist and utopian impulses, invoking a cosmic protagonist, an heroic egalitarian multitude. That millenarian or chiliastic tendency persists, though in a muted subterranean form, in The Cry, whose bold counterpoint is the recovery, simultaneously hypothetical and imperative, of a free and prosperous homeland. * One of the points I raised in my paper—accessible to all, courtesy of IN OUR OWN VOICE—is the need for scholars to do the necessary detective work and document Allos’ fabled “mobility” which has puzzled or confused numerous Asian American pundits. In short, we need more critical research into Allos’ life in the Philippines and here from his birth to his death on Sept. 11, 1956. We need younger unprejudiced scholars to shift through the papers in the Bulosan archive at the U of Washington Library, and elsewhere, and classify everything in a systematic way. Because of the neglect of this necessary work, texts like All the Conspirators have appeared which cannot be authenticated properly. The late Dolores Feria and others suspect that many writer-friends who helped Allos throughout the years, in various capacities, had a hand in many of his texts, some even responsible (in my view) of composing them. Too bad that Josephine Patrick and Sanora Babb can no longer answer our questions; but their papers, in particular those of the Babb sisters, may provide clues. Numerous letters to a wide variety of correspondents here and in the Philippines need to be added to the pioneering collection that Feria edited in 1960, Sound of Falling Light. In a letter to me dated Sept 30, 1976,a certain PC Morantte disputes the birthdate of Nov. 24, 1914 which Allos put down in his autobiographical sketch for Stanley Kunitz’s Twentieth Century Authors (1955)—Morantte conjectures it was Nov. 14, 1914. In the sketch for Poetry magazine, Allos put down Nov. 24, 1913 and his arrival in Seattle on July 22, 1930, compared to 1931 in the earlier account.Morantte also contends that, based on information from Allos’ brother Aurelio, Allos finished third year high school (not three semesters) in 1929, serving as editor of his high school newspaper. Some Filipino-American enthusiasts have been misled by Morantte’s self-serving prevarications. Morrantte denies that Bulosan ever had leftist or Marxist sympathies. The FBI records recently secured by Professors Hirabayashi and Alquizola, aside from the 1952 ILWU Yearbook and Bulosan’s letters and numerous texts, reveal the opposite. Blum, William. 2005. Rogue State. Monroe, Maine: Common Courage Press. Bourdieu, Pierre. 2000. Pascalian Meditations. Stanford: Stanford University P.
-----. 1978. The Philippines Is in the Heart. Quezon City: New Day Press. -----. 1979. “I Want the Wide American Earth,” Unity (July 13), 15. -----. 1988. “Two letters.” In “Two Letters from America: Carlos Bulosan and the Act of Writing” by Oscar Campomanes and Todd Gernes. MELUS 15.3 (Fall): 31-46. ----. 1996. “The Romance of Magno Rubio.” In Asian American Literature, edited by Shawn Wong. New York: Addison-Wesley Educational Publishers, Inc.
D’Agostino, Guido. 1943. The Best American Short Stories 1943, edited by Martha Foley. Boston: Houghton Mifflin Co.
Morantte, P.C. Personal letter to me, dated Sept. 30, 1976. Mostern, Kenneth. 1995. “Why is America in the Heart?” Critical Mass, 2.2 (Spring): 35-64. Pomeroy, William. 1970. American Neo-Colonialism. New York: International Publishers. Ponce, Martin Joseph. 2005. “On Becoming Socially Articulate.” Journal of Asian American Studies 8.1 (February): 49-80. Carlos Bulosan. Philadelphia, PA: Temple University Press. ----. 1996. The Philippine Temptation. Philadelphia: Temple University Press. ----. 1996. “Searching for the Heart of America?” In Teaching American Ethnic Literatures, edited by John Maitino and David Peck. Albuquerque: University of New Mexico Press. 259-72. -----. 2004. Working Through the Contradictions: From Cultural Theory to Critical Practice. Lewisburg, PA: Bucknell University Press. E. SAN JUAN, Jr. directs the Philippines Cultural Studies Center in Connecticut, USA. He will be Rockefeller Foundation Fellow at the Bellagio Center, Italy, this Fall 2006. He was previously Fulbright Professor of American Studies at the Katholieke Universiteit Leuven, Belgium, and visiting professor of literature at National Tsing Hua University, Taiwan. His recent books are Sapagkat Iniibig Kita and the reissued Toward a People’s Literature both published by the University of the Philippines Press; also Racism and Cultural Studies (Duke U Press), Working Through the Contradictions (Bucknell U Press) and the forthcoming In the Wake of Terror: Class, Race and Nation in the Field of Global Capital (Lexington Books). He is editorial advisor for Atlantic Studies, Nature Society and Thought, Cultural Logic, Amerasia, KritikaKultura, and other journals.